It’s been two years since Microsoft bought Minecraft, and the new owners are faced with a conundrum: what do you do with a game that is already a phenomenon? Complicating things further, Minecraft is now a seven-year old game. While lot of work has been put into keeping the game current, Minecraft is also beginning to show its age. Mojang developer Nathan Adams compared it to rebuild the engines of a jet in the middle of a flight, because taking the game down to patch it just isn’t an option. The tension at the heart of Minecraft heightens when you consider that the developers say difficulties associated with coding the blocky builder sometimes prevents them from adding features that the community wants, like a working API or a server browser. I got a chance to suss out the future of Minecraft at last month’s Minecon, where the community rubs elbows with the people who make Minecraft great. Obviously, that description includes the developers, but it also expands farther into the YouTubers who make hilarious videos, the modders who create new ways to play, and the builders, who create wonderful worlds for others to enjoy as well. This was at the forefront of my mind when I attended Minecon. Minecraft has always been a community-driven game, and I was curious how Mojang would handle that aspect of Minecraft’s identity while also pushing the game into new frontiers. I met with Saxs Persson, developer for the Pocket and Windows 10 editions of Minecraft, and Max Booty, head of Minecraft, in nearby Marriott hotel. Persson was dressed casually, in a black shirt and jeans. He came off as enthusiastic, prone to geeking out about new tech or features. Booty on the other hand was dressed in a button-down, slacks and came off as more reserved. They couldn’t have chosen a better pair to represent Minecraft. “We want everybody to play with everybody,” Persson told me. “Minecraft is better when you can connect to your world wherever you with whatever device.” Windows 10 and Pocket Edition players already enjoy cross-platform play, but Persson paints a picture of complete compatibility – console and Java and Win 10 players all connecting and enjoying Minecraft together. In his ideal world, you’d be able to log on to the same persistent server from your iPad, your computer, and your console—a technical and legal hurdle that has been branched in part by games like Rocket League, but full connectivity across all platforms still seems like a lofty goal for Minecraft. What’s more, this idea seems to ignore that the various Minecraft editions floating around all have varying features, something that even the biggest Minecraft fan finds annoying. For example, MCPE is still missing The End, but at the same time it will get additions that Java won’t see till later (or ever.) Persson didn’t specifically address version mismatches when I asked if feature parity was still a priority, but he also didn’t seem concerned about potential version conflicts. “There’s not a lot holding us back from connecting these versions, and parity is not the main goal,” he said. There is no doubt that this kind of cross-platform play would be popular and welcomed, but I’m skeptical as to how it would actually work. I’m also not sure it’s a feature that the community truly cares about. Persson also enthused about “new input methodologies,” specifically the Oculus touch. Actually, VR played a big role in Minecon: the line to try it out was hours long throughout the entire event, and Mojang highlighted it often enough that VR seems to form a centerpiece for Minecraft’s future plans. Virtual reality is still an incredibly niche technology, and Minecraft’s hallmark has always been its accessibility—you can run the game on pretty much any device. It’s hard to understand how adding a style of play that requires a powerful computer or console and a pricey headset fits with the existing appeal of Minecraft. Community response to VR offerings is and always has been tepid at best, especially among veteran Minecraft players, who remember Notch’s quarrel with Oculus in the past. For now, most of the YouTubers and map makers and modders attached to Minecraft seem pretty happy with their current arrangement—Mojang is still very relaxed about letting people profit off of their game—but some are starting to see the writing on the wall. Long-time Minecraft YouTubers, such as skitscape and setosorcerer, have been moving on to other games or other careers. Map creators like Hypixel have had to adapt and often abandon single-player maps in favor of multiplayer ones, and the often-ignored mod community is starting to feel the strain of an aging game. Each recent patch has created a new set of problems — a recent one, for example, made many large texture packs unuseable, and while a different patch made PvP unplayable for many. With add-ons and an API still a long way off, frustrations continue to mount for some fans. Mojang’s vision for the future of the game and the communities’ vision have not always been in line, and you could see the effects of that fissure on the showfloor itself. When I asked how they chose the people that ended up on stage at Minecon—essentially receiving the Mojang stamp of approval—or heading up the panels, Persson and Booty were a little evasive. “There is an active curation [of exhibitors],” Booty said about the people that were invited to attend the event and present, “ranging from trying to stay true to Minecraft’s indie roots to working with corporate partners and everything in between.” This was an obvious nod to the big name partners like Mattel that were taking up large amounts of real estate on the expo floor. There were plenty of indie names and creators features, but their competition was fiercer. The Minecon docket was stacked with young, high energy personalities who curated an atmosphere of fun and excitement—the old guard, like Hypixel and other creators, were less well represented. Persson and Booty still recognized, at least in part, the debt that they owed to the the community. “We ask that they come and meet their fans with open arms,” Persson said, “as a true fan event, not just a primarily corporate one.” Persson and the Mojang team seem eager to signal to their fans that they were still the focus of the event and of their efforts, and that the Microsoft buyout still doesn’t indicate a change in direction or an abandonment of their core users. It was a necessary reminder, given that Minecraft’s indie origins made some people deeply skeptical of Microsoft’s purchase, and these same fans have remained guarded even as the company seeks to reassure them. Regardless, the Mojang team has actually shown that they are listening to the community in some respects. Minecon saw the first full presentation of the add-on system, which allows players to tweak the behavior and statistics of mobs at first, and will eventually allow wide modification of all entities. Players have been asking for something like this as far back as 2011. “Add-ons are just the first step,” Persson said, confirming that an application program interface, or API, was being co-developed – a feature that would make modding significantly easier. Persson admitted that two previous attempts at creating an API had failed, and that they had brought on the creators of Forge – a popular mod utility – to help them make this attempt stick. This may represent a serious commitment to developing an API, but those promises go back as far as 2009. The community remains skeptical after being burned so many times before. Minecraft’s indie origins made some people deeply skeptical of Microsoft’s purchase. It’s also obvious that Microsoft has invested heavily in making Minecraft more than just a video game. Minecraft’s developers preferred to use words like “platform”, “tool”, and “environment” instead of “game,” and they were effusive about applications for research, education, and machine learning. “At a high level, we want to maintain Minecraft as an innovation brand,” Booty said when asked about his vision for the future of the game. It was a little hard to pin down exactly what they meant by this — it sounds like they want Minecraft to be all things to all people, which, while ambitious, sounds like a recipe for failure. Despite the abundance of buzzwords, Mojang’s description is a telling indication of Microsoft’s concerns over their $2.5 billion investment. Minecraft is a completely unprecedented phenomenon, and so too is a massive buyout of an indie game by a major corporation. 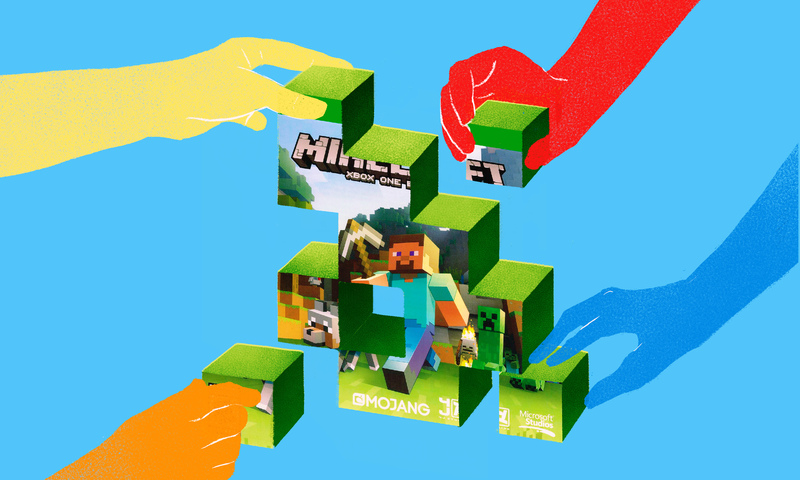 Minecraft has already conquered video games, so it seems natural that Microsoft and Mojang now want to create something that supersedes gaming. Everyone I talked to at Minecon was excited about exactly one thing—meeting their heroes, whether that was one of the developers, a popular YouTuber, or a modder. As far as the fans are concerned, the future of Minecraft will always be with the people who make the game great, not fancy technology. Mojang has loftier goals, though it’s hard to say if VR and added connectivity truly hold the key to where Minecraft goes next. Then again, predicting the future is no easy task. Original story published on Kotaku. Masthead illustration by Angelica Alzona. Republished with permission.